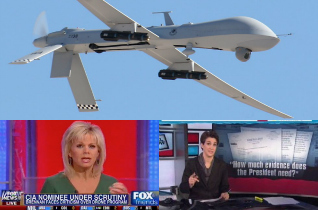 The best part about the drone ‘kill list’ revelation dominating cable news this week? Hint: It has little to do with whether the policy is actually effective or not. Don’t you know? Victory is the end game in cable news and message board “debate”, not actually resolving anything. It’s also not about finding a solution to a problem, but neutering what is perceived to be the opposition. In this case, the no-longer-secret drone policy—one that allows the Obama administration to kill any American citizen suspected of being high-ranking members of al-Qaeda, including Americans, without due process — isn’t allowing the usual suspects in the media to gleefully underscore hypocrisy and stupidity on the other side of the aisle. All the traditional roles have been turned upside down, thereby rending the standard routine meaningless. On the left, only a handful of media progressives are calling out the president’s neocon position, while the majority is sitting this one out. They’re simply not wired to condemn the president in any fashion. For those who are analyzing it, the criticism comes without the usual vitriol and outrage previously reserved for the GOP. Is Rachel Maddow exploring the subject? Sure…but she won’t dare label President Obama a war criminal as she did during a similar scenario with George W. Bush (nor did Chris Hayes during a segment earlier today). So how do conservative media outlets feel about this issue? It sounds like the answer should be a slam-dunk with Mr. Obama mimicking and even escalating Bush 43’s anti-terrorism efforts on the drone front. Surely they’re patting the president on the back for continuing an aggressive strategy on the war on terror, right? Instead, the kill list revelation is seen as a golden opportunity to call out the president’s hypocrisy for being anti-torture but pro-assassination. From there, the drill on the TV side is simple: Book a liberal guest and force him or her to denounce Mr. Obama on the issue. Yup, there’s no bigger victory in cable news than providing the audience with that anomalous moment when a Democrat or Republican is driven to criticize a prominent member of its own party. Bin Laden at the bottom of the ocean? Check. The old Bush defense of “No attacks on American soil since 9/11?” Check (although an argument for Fort Hood can be made). Drone strikes taking out Al Qaeda chiefs on a regular basis? Awesome. AQ leaders looking up at the sky every eight seconds wondering if they’re next? Priceless. President Obama deserves praise for staying on the offensive in this department, but that sentiment isn’t exactly being echoed on Fox News outside of Gretchen Carlson and John Bolton this week. So ask yourself this: What would the liberal media reaction be in 2005 if it was discovered that George W. Bush had a kill list that included targeting American citizens abroad? If Twitter existed, it would break. Mass protests would commence in front of the White House. MSNBC would launch MSNBC 8, The “Ocho” to cover it all. Michael Moore would (insert the outcome of your choice in the friendly comments section below). People were fighting mad about Abu Ghraib, and they’d completely lose all sanity if the words “Bush,” “kill list” and “Americans” appeared in the same sentence. And what would the conservative media response be if it was discovered that Bush 43 had the same kill list while in office? The drone policy goes from being applauded by conservatives to somehow being just another opportunity to mock the President. All of this while liberals are transformed from being utterly outraged to strangely silent, or at the very most…kinda-sorta disappointed for about ten minutes. Remember, the only goal on both sides of political opinion media is to bruise the enemy whenever and however possible (as if there’s never common ground on any issue). No one on the left or right knows how to handle this story. It’s unwittingly putting them on the same side as an opposition they loathe. Like forfeiting one’s principles…if they even existed in the first place.